Looking for a new cabinet saw? Well, you’re in the right place. 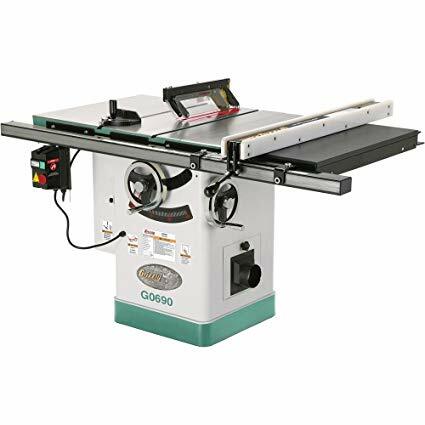 We’ve reviewed top-of-the-line cabinet saws for you and found some real deals. Fine woodworking needs excellent equipment, right? 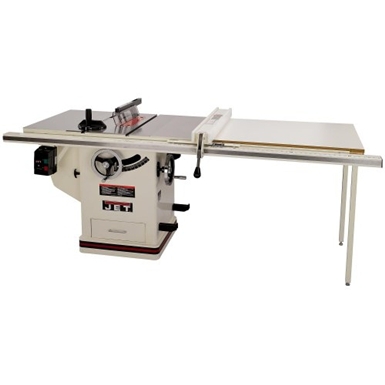 Well here’s a list of the top table saws from top brands like Jet, SawStop and more! The SawStop PCS175-TGP236 is a serious cabinet saw. It may be the last cabinet table saw you ever buy. It’s so sturdy, reliable and well-built that it should be called “Envy”. It’s got some stiff competition, but the people have spoken and this saw is definitely at the top of the sawdust making pile. If you’re looking for a cabinet table saw then you probably already know how important it is to have an exceptional rip fence. If it can’t lock in place for 5 hours of ripping ¾” hardwood plywood then it doesn’t cut it, right? 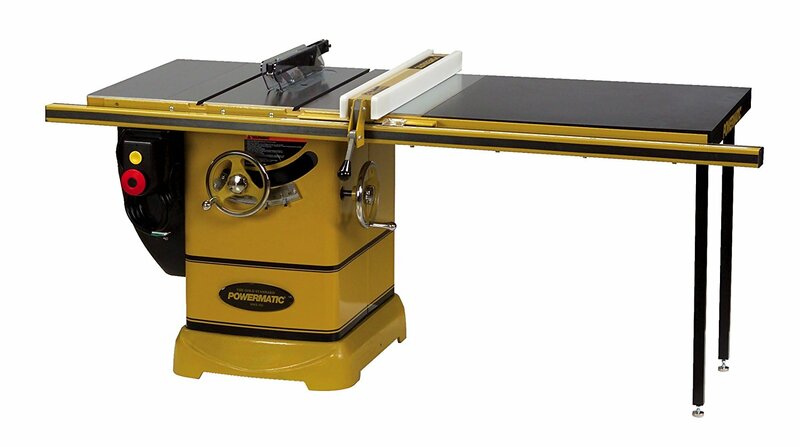 A saw is only a cabinet saw when it has a solid, cast iron table top that won’t warp from heat or moisture. All of the models reviewed here have solid, cast iron tables. The only variations are in fit and finish. 1.75 horsepower or 3 horsepower? 110-volt or 220-volt? Those are the questions we’ll answer for you as you breeze through these reviews and choose your next best friend. These products all have powerful motors but if you specialize in hardwoods, consider ones with 3 horsepower. You’ve only got so much space, right? So, keeping that in mind, we’ll tell you how much space each model takes up. Some models have a bigger footprint and some smaller. Some have extensions and some don’t. Some people like to build their own extension tables with shelves and drawers. We’ll let you decide. Table saws are not toys. The Consumer Products Safety Commission that there’s a table saw accident every 9 minutes and 10 amputations every day in the U.S.
Yikes! So, safety is a key factor and, given that reality, you’ll quickly learn why we chose the SawStop as our Top Choice. 1 ¾ or 3 horsepower motor available to meet your specific needs. The Professional T-Glide fence system is made of high-quality, thick gauge steel and locks down tight without deflection. 36” rip capability. The dust control system captures an industry leading99% of sawdust! The heavy-weight trunnion has the thickest arbors on the market. The true vertical trunnion travel has a gas-piston assist for ultra-smooth and easy operation. The table is cast iron and won’t warp or bend under even the most intense working conditions. Accepts any dado blade made. The Show Stopper – this saw has incredible new technology that can sense contact with human skin and stop the blade within milliseconds! It can actually tell the difference between a human finger and a piece of wood. Assembly time maybe 3 to 4 hours. This model is worth its weight in gold. It’s just over $2700, will last a lifetime and can actually protect you from serious harm! It’s truly a precise, well made machine that will make you giggle with childish joy every time you use it. 3 horsepower motor cuts through oak and other hardwoods without bogging down. The integrated, push-button arbor lock is accessible from the table top for quick blade changes. The quick release riving knife and blade guard make for easy and tool-less mounting and removal. The over-sized “Stop” button is a great safety feature. The 50” rip fence is square, smooth, and perfectly designed. The enclosed cabinet keeps the internal mechanisms clean. Dado blades are this saw’s friends. Poly-V belt drive system for efficient, quiet operation. 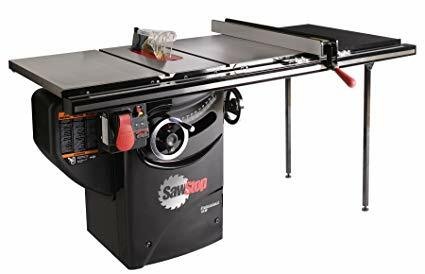 The heavy-duty cast iron table and cabinet and the trunnion mounted motor make this saw almost vibration free and much quieter than other 3 horsepower table saws. Assembly time may be over 4 hours. 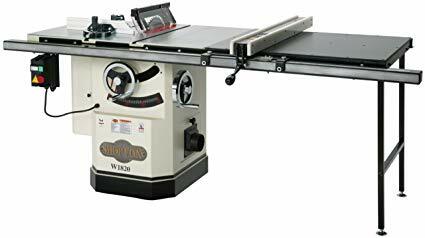 This Jet is one of the best rated cabinet table saws. And for good reason. Its precision made, high quality parts and quiet but powerful motor make it very user friendly. The dust collection system works extremely well and it has all the right safety features. At just over $2600 it’s easy to invest in this invaluable tool. This cabinet saw only requires 115-volts. That makes it easy to plug into any shop. Dust collection is maximized by a unique blade surround and an unobstructed collection hose. Well located, large, hands-free Stop switch for safety. Rigid and precise AccuFence locks down tight and won’t move until you move it. Ergonomic 7” handwheels actually provide momentum, which makes blade height and bevel adjustments much easier. One handed, quick blade changes with the integrated Arbor-Lock makes the job move along quickly. The hinged motor cover for quick access to the interior of the cabinet is a feature you’ll come to love when cleaning or repairing this machine. Motor is not trunnion mounted but is kind of a “hybrid” between table mounted and trunnion mounted. This is a great saw for the professional or the serious hobbyist. It’s got plenty of power and a great stop switch that’s perfectly placed to bump it with just about anything if the need arises. This well-built machine will definitely make your job easier! The 3 horsepower Leeson motor is a beast! It has massive trunnion mounts. Triple belt drive for smooth cutting, low vibration and high durability. 50” rip capability. Table size with extension – 27” x 74”A camlock T-fence that gets easier to push as it tightens. The T-fence also has a phenolic face and smooth gliding nylon runners. The true riving knife follows the up and down movement of the blade. The magnetic switch also has thermal overload protection built in, so you don’t have to worry about it getting too hot on long work days. The blade guard is completely clear and un-obstructed so you have a perfect view of the blade and material. The miter gauge has an adjustable T-slot and anodized fence with extension and flip stop. Includes standard and dado blade inserts so you’re set to go! It’s as heavy as an elephant. May require up to 4 hours and 2 people to set up. Don’t want to hurt your budget? At under $2,000 this saw will do everything you need. It’s a well-built, heavy duty saw that wants to cut and cut and cut! Built for heavy labor and long hours, this saw can keep your shop running smooth. Ultra-powerful 3 horsepower Leeson motor spins the arbor at 4,300 rpm. But it’s 220v and can’t be converted to 110v – so make sure you have the right outlets in your shop. Table size with extension – 27” x 40”Takes dado blades up to 13/16” and comes with the insert. Burly cast iron trunnions hold the motor to the cabinet and reduce vibration. Cast iron cabinet also helps absorb vibration and will last for many years. Camlock T-fence with HDPE facing for smooth gliding of stock. Quick release feature for changing out guard and riving knife. Hardened, precision ground and polished cast iron top for years of solid service. Quick access door in the back where the dust collects (and where you will, at some point, drop the arbor screw!). Another quick access door in the cabinet to get to the motor. The green bottom is a sticker and will peel off and get scratched up. Useless hooks on the back of the saw. This saw is a very close copy of the ShopFox 1820. They’re almost identical, actually. So, you know it’s a good saw and well worth the price at just over $1800. It’s a tough saw with many happy reviews so feel good about this purchase – it’s worth every penny! The SawStop PCS175-TGP236 takes the sawdust cake this time around. Not only is it well built and smooth operating, the technology that can sense the difference between a body part and a piece of wood and can, literally, save a limb! It’s no contest, really. These are all great saws but the SawStop clearly cleans up the competition. The search is over, this is the saw to buy.